Anyone else kind of in shock that it's already Monday?! I don't drink coffee often, but today I might need it. It's going to be sooo cold here this week too, and I am not ready for winter whatsoever. So maybe my California Dreamin' tank is especially appropriate for today's post haha. This is such an easy outfit to throw on for dinner or on the weekend! Saturday I wore this jacket and graphic tee with different distressed jeans and sneakers, and it was comfy and casual for a day of hanging out with family. My California Dreamin tank is sold out everywhere in the gray, but I did find it 40% off in white! 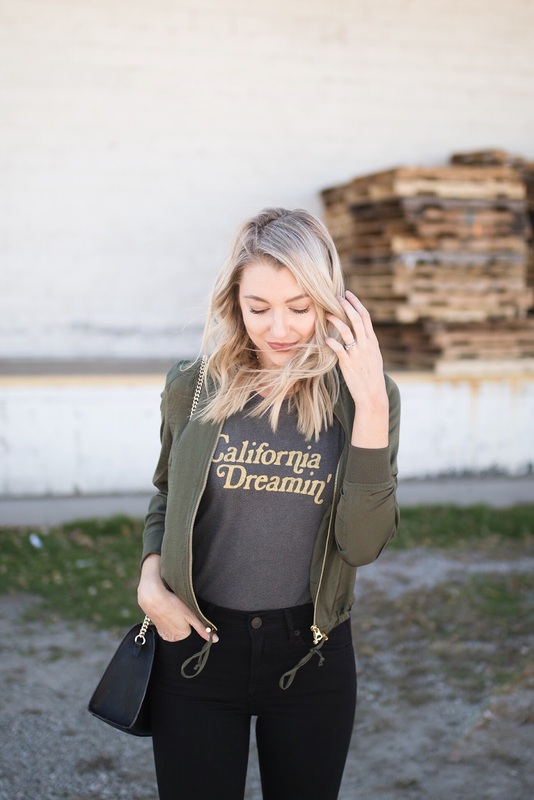 It may seem like a weird time of year to buy a graphic tee or tank, but I love having some to layer under bomber jackets or cardigans for a casual, effortless vibe.